Burdwan University Result: University of Burdwan is an autonomous state university commonly known as Burdwan University (B.U). It was established on 15 August 1960 as a teaching and affiliating university by the Government of West Bengal in Bardhaman, WB. The jurisdiction of the university is spread across the districts of Burdwan, Purulia, Bankura, Birbhum, and Hooghly. BU has around 189 affiliated colleges spread across the state and 34 PG departments offering PG courses in various discipline. University offers more than 30 undergraduate courses, 66 postgraduate courses, and various Ph.D. programs. Along with these courses university also provide several programs through distance mode. All the PG programs under distance mode are conducted through the Directorate of Distance Education (DDE) of the university. BU has two faculties viz. Arts & Commerce and Science. Admissions in the university are made through various entrance exams, centralized counseling, and merit in the qualifying exam. University has been ranked in the band of 101-150 overall and 96 among universities by the National Institutional Ranking Framework (NIRF) in the year 2018. Latest Update 14/03/2019: University of Burdwan has published Ph.d and MBA results. Candidates can check it from below Links. In this article students will find all the important information related to the University of Burdwan results along with details about university profile, admission process, academic system, and exams. Admission to University of Burdwan are open to students from all over India and are basically done on the basis of the various state-level exams like WBJEE and entrance exams conducted by the university itself. University conducts separate entrance exams for every program. All the candidates aspiring to get admissions into the university are required to apply through online mode. They are required to fill an online application form which is available at the university website. Candidates must submit the application forms before the last dates. After the completion of the application form university issue, the admit cards to the registered candidates. All the candidates have to carry the admit card to the specified exam centers. Candidates without the valid admit cards are not entertained under any circumstances. The department of Controller of Examination of the university manages the conduction of the examinations, declaration of the results and all the related responsibilities of the university. University follows a semester system and Choice Based Credit System for some of the courses. Below we have shared details about the university exams and results. The end semester exams for UG and PG programs are conducted in November/December and on the other hand, the even semester exams are organized in May. Students have to fill examination forms in order to be eligible for end semester exams. Examination forms are made available on the university website. Students have to print the admit card and have to carry it to the exam center on the day of examination. Without the hard copy of the admit card, no student is allowed to sit in the exams. The results for odd semester exams are declared in the month of January and for even semesters in June. The university publishes all the results only through the online mode. No hard copy of the result is sent individually to any of the university student through post or any other medium. BU notify the students about the university results through its official website/portal. Therefore, students are advised to stay in contact with the university website to get the updates related to university result. The university results include the following details of the students such as name of the course, name of the students, semester, roll number, dates, SGPA and result. Students can collect their mark sheets from the respective university department. University also update the information related to distribution of the mark sheets on its official portal. 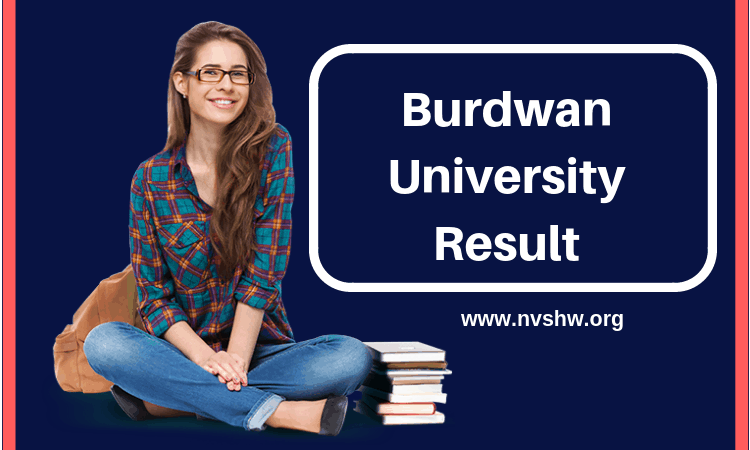 How to check University of Burdwan University Result? Visit the official website of the university i.e. www.buruniv.ac.in. On the homepage of the portal find the results section. Check the roll number and result. Download the result PDF for further references in the future.